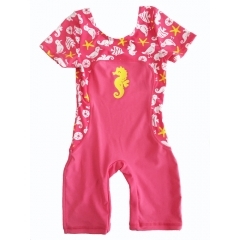 Sweet & Soft Toddler Girls Swimwear Once Piece Seahorse Swimsuit Rashguard Seahorse Print On One Piece Rash Guard. 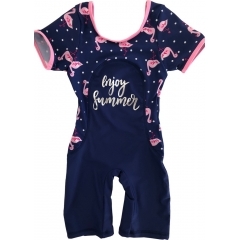 Little Toddler Girls Will Love To Wear This One Piece Swimsuit. It Is A One Piece Swimwear With Matching Rashguard. Colors Are Pink And Royal. This garment can keep your child comfortable whether training in the pool, attending a swim class at school or playing at the beach. This pretty two piece swimsuit includes a pink bikini halter top, pink bikini bottoms, and a matching rash guard with Polka Dot. It is sure to be her summertime favorite! Rash guard girls swimwear,custom bathing suits with embroidery fish design. Infant Girls Two-Piece FISHALISH-BLU Swimsuit Polyester and Spandex fabric. 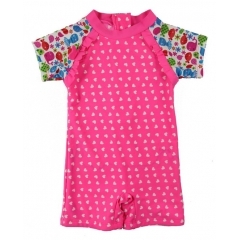 A very popular toddler girls rash guard swimwear with lovely bee style. Stripes Little Girls One Piece Rash guard bathing suits,easy front zipper,it's a quite popular girls rashguard. A lovely one piece rash guard for baby girls, bright colors,good elasticity and strong resistance to chlorine kid girls rash guard swimming suits. 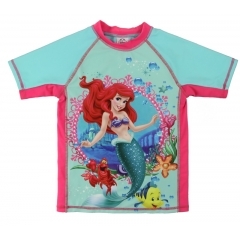 Disney's little mermaid children girls rash guard top, the UV index of this kid’s swimwear reaches UPF50+.